Even before he played his first major league game, Bryce Harper cards were creating a lot of noise in the hobby. As the superstar continues to put up impressive numbers, collectors are still clamoring for Bryce Harper rookie cards and prospect cards. The modern hobby is more complicated than the way things used to be. There was a time when it was easy to designate a player's rookie card. Today, not so much. Defining a rookie isn't hard, but the way people collect now is different. Bryce Harper rookie cards and prospect cards are a good example of this. 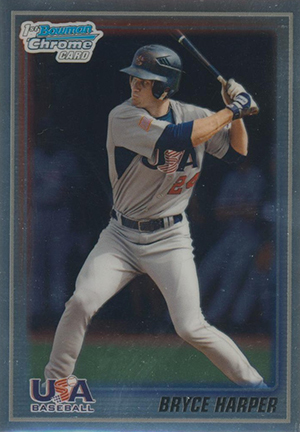 His first licensed cards came out in 2008 with USA Baseball box sets made by Upper Deck. These are treated by many more like minor league cards but they're certainly still very desirable. Shop for early Bryce Harper cards on eBay. 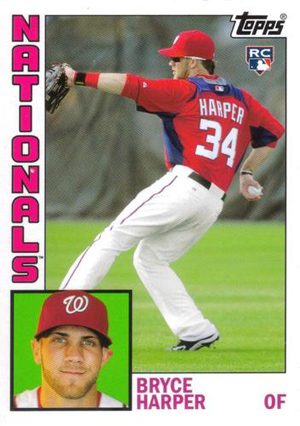 Moving forward, Harper appeared in a Nationals uniform in several 2011 MLB sets. But they were technically all inserts, even if they did look an awful lot like the base cards. So, by definition, they still weren't rookies, although these Bowman-branded cards are certainly treated as such by many. Finally, once he debuted with Washington, official Bryce Harper rookie cards started to roll out. These were the first to be included in an MLB base set. No matter your definition or preference, there are a lot of great Bryce Harper rookies and prospect cards to chase. But which ones are the best? A lot of that is going to come down to personal taste, interests and even budget. But there are some that have a certain iconic appeal or added significance. The following is a list of 10 key Bryce Harper cards released between 2008 and 2012, capturing his move up to the majors through his rookie season. While value does play a factor in this list, it's not the primary reason. Also, only cards that are somewhat regularly available are listed. Rather than include several parallel versions of the same card, we've rolled them into the main card as well. Check out the full Bryce Harper rookie card checklist in our detailed player profile. Included as a part of a box set, this card's importance comes from being the first major Bryce Harper card. Singles aren't terribly tough to find, but they are steadily climbing. 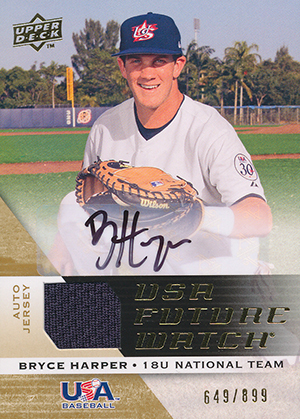 Numbered to 899, the 2009 Upper Deck Signature Stars USA Future Watch Bryce Harper is one of the phenom's more plentiful autograph cards. And while Harper has several rarer signatures in earlier USA Baseball sets, they're very tough to come by and command a huge premium. Of course, this card is expensive, but the larger print run keeps it a little more accessible. Prospectors love Bowman Chrome. The brand goes hand-in-hand with young players and emerging stars. That's why this card is on the list. 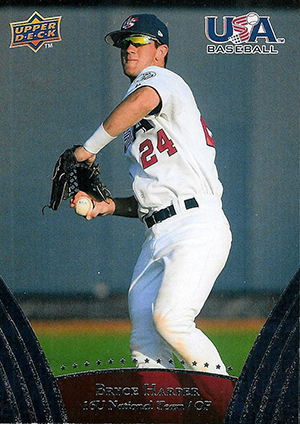 The 2010 Bowman Chrome 18U USA Bryce Harper may not be a rookie, his first card as a professional or even his first in a national team uniform. But it is the first time he appears on a Bowman Chrome card. An autographed version was also inserted as a buyback in 2010 Bowman Draft wrapper redemption packs. Limited to 100 copies, the autographed version is one of the most valuable Bryce Harper cards produced. One of the best thing about AFLAC autographs, beyond their secondary market appeal, is the fact that you're getting some of the earliest signatures of the featured player. Usually, this means something much more attractive. 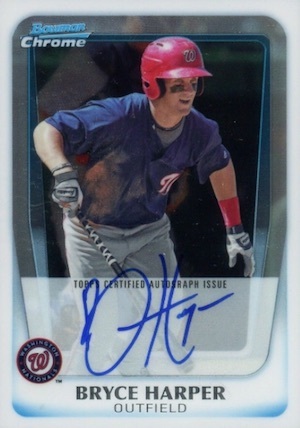 Compare Harper's signature here to the abbreviated name on most of his other cards. Add to that, it's on-card. AFLAC cards were made by Topps at the event and signed immediately. Collectors should be aware that players get some of their own copies that they can do what they want with. These are not serial numbered. 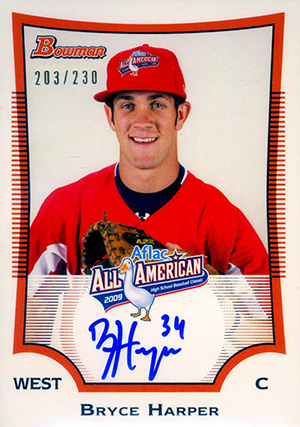 You should be extra careful if you come across a signed Bryce Harper AFLAC that isn't serial numbered as someone may have bought one without the signature and added one. Serial numbered versions are definitely the safest way to go. In a technical sense, the 2011 Bowman Chrome Bryce Harper isn't a rookie card. But a lot of collectors treat it that way. Because it's numbered outside of the base set, traditional definitions put it in prospect or insert card territory. Really, it's a matter of semantics, but the significance is not questioned as it's the first to picture Harper in a Nationals uniform. For those who can't afford the autograph, this is a great option. It is worth noting that despite being a Bowman Chrome card, it's found in 2011 Bowman Baseball boxes. 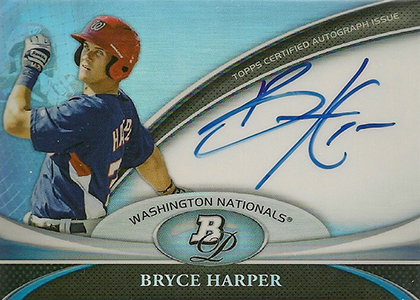 The 2011 Bowman Chrome Bryce Harper autograph is probably his most important card. When you get into the Refractor parallels, it's certainly one of the most valuable Bryce Harper cards in existence. Bolstered by an on-card signature, it's instantly recognizable and carries a premium value. This card is inserted in 2011 Bowman Chrome Baseball. 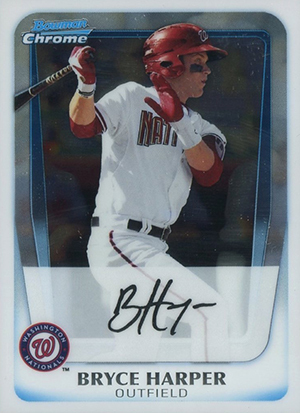 A more affordable alternative to the Chrome autograph, the 2011 Bowman Platinum Bryce Harper still has a hard-signed autograph. The Refractor finish also gives it a more high-end feel. Although it doesn't carry the same iconic swagger as the 2011 Bowman Chrome Bryce Harper, many collectors may be happy with the lower price tag. 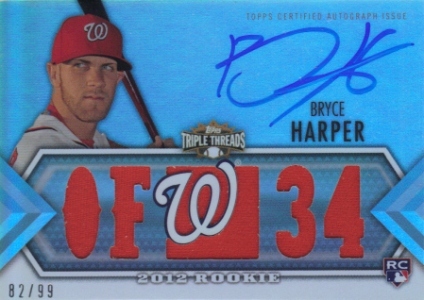 Some collectors are still trying to finish their 2012 Topps Archives master sets thanks to the Bryce Harper SSP. A last-second addition to the checklist, it has the added notoriety of being the first official Bryce Harper rookie card on the market. 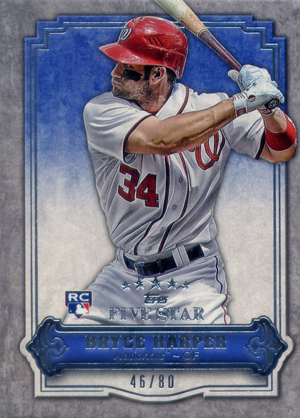 Of the Bryce Harper cards that carry the rookie label, 2012 Topps Five Star is the rarest. Limited to just 80 copies, it comes from a pricey product that is more about hits than the base cards. When it comes to the variety of Bryce Harper autograph cards released between 2008 and 2012, there is no shortage. However, only the 2012 Topps Triple Threads Bryce Harper carries the distinction of being an autographed rookie card as it's the only one that's part of the main set. The rest are either inserts or parallels. The TTT RC is signed on-card, is limited to 99 copies and has jersey swatches. What is the best card shop in the DC/Virginia area? cards in DC? � Not from the DC area but if you search “sports cards washington dc” on Google, you should get some hits. My brother-in-law is a BaseBall card fiend and loves to share his passion. He lives near D.C. and like I loves the Nationals as much as Baseball itself. Having children too, he goes to a small store A.J.’s in or near Vienna Va. I have been there once with him and the owners are very nice. They are priced well I thought, but one part owner thinks that every child is pack searching while the other is laid back, so if your stopping in for packs I suggest having them pick for you. Hope this helped! 2009 Bowman AFLAC Bryce Harper PSA DNA 10 AUTO Gem MT #BH RC All American HOT! 2011 Bowman Chrome Bryce Harper RC AUTO Autograph PSA 10 Gem Mint - HOF!! !